Louisiana’s own annual outdoor adventure, Zombie Hunt, will return to Sulphur, Louisiana during the month of October. Recognized as Halloween’s “must-do” family-friendly attraction, the seasonal paintball and laser tag event is set to kick off the premiere of the newly expanded Bayou Games Paintball Complex – a national-caliber outdoor arena. Set amidst the expanse of the Paintball Complex’s 31 acres of dark, haunted woods, Zombie Hunt provides an evening of immersive, high energy fun for all ages. Participants board one of Bayou Games’ Tactical Zombie Response Units and take their own seat – outfitted with a custom gun and glow-in-the-dark paintballs – then head into the moonlit woods to stop the approaching live zombies. Available for advance purchase, the Zombie Slayer Combo Ticket takes participants straight from the excitement of the paintball excursion to the next level of fast-paced thrills on the Paintball Complex’s Laser Tag Zombie Battlefield for one-on-one action: human against zombie. 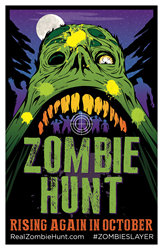 An established annual event in the region, Zombie Hunt 2017 will commemorate Bayou Games’ full consolidation of its entire catalog of distinct properties and service offerings to new headquarters on one property, with phase 2 construction of the entertainment company’s multi-year expansion blueprint finished. The premier provider of family-friendly entertainment attractions for the Southwest and South Central Louisiana regions and Southeast Texas, Bayou Games and its respective divisions operate a 31-acre paintball and laser tag complex, a thriving mobile party services division, special events, and many other all-ages activities under the Bayou Games brand to best serve an increasing national customer base. “We’re very excited to see the completion of our second stage of expansion under one roof – just in time for our annual Zombie Hunt. Our contractor and crew have been working hard for months to ensure our 31-acre site would be ready on time to handle the large numbers of guests we entertain every year,” says Alexander Nicholson, Facility Manager of Bayou Games, Inc.
Bayou Games provides a vast array of recreational activities, educational games, STEM-aligned School Field trips, and special events for all ages (Paintball, Arrow Tag, Bubble Soccer, Dodgeball, Laser Tag, Nerf Dart Wars, Hero Blast, and more), combining the immersion and engagement of outdoor entertainment with the social, active fun of a playground in a safe, clean environment. “We’re experiencing a strong resurgence of popularity in the paintball hobby, in addition to the ‘turn off the tech and get active’ movement,” says Todd Nicholson, CEO of Bayou Games, Inc.
Louisiana’s annual live Zombie Hunt 2017 runs October 13 – October 28 at Bayou Games Paintball Complex: 681 Kim Street, Sulphur, Louisiana 70663. Purchase tickets, official Zombie Hunt merchandise, and more on the official website: RealZombieHunt.com. Advance Zombie Slayer Combo Tickets are on-sale now. View the Zombie Hunt trailer on facebook @RealZombieHunt and be sure to connect with official Bayou Games social media accounts on Instagram, facebook, YouTube, and others for hi-definition videos, behind-the-scenes access, special discounts, VIP Fun Packages, and more. The premier provider of family-friendly entertainment in Southwest Louisiana, Bayou Games and its respective divisions operate a 31-acre outdoor facility featuring a tournament-spec paintball field and woods for battle scenarios, laser tag areas, a thriving mobile party services division, national touring events, and traditional recreational activities for all-ages under the Bayou Games brand to best serve a national customer base. Bayou Games’ Mobile Party Services division, features a 33-foot, self-powered video gaming rig with 6 large HDTV’s and Xbox One, Xbox 360, and Nintendo Wii game consoles; Laser Tag; Arrow Tag, Bubble Soccer, and more for the ultimate entertainment experience for all ages at any site – residential or commercial. A thriving service in the Southwest and South Central Louisiana regions, Bayou Games has expanded its reach to Southeast Texas, taking the party to clients’ doorsteps for corporate events, birthday parties, family reunions, festivals, fairs, schools, and more. Bayou Games employs a professional and dynamic staff that works hard and plays harder to host the “BEST DAY EVER” for all. Vice President, Bayou Games, Inc.